Cut designer paper to 11” x 11”. 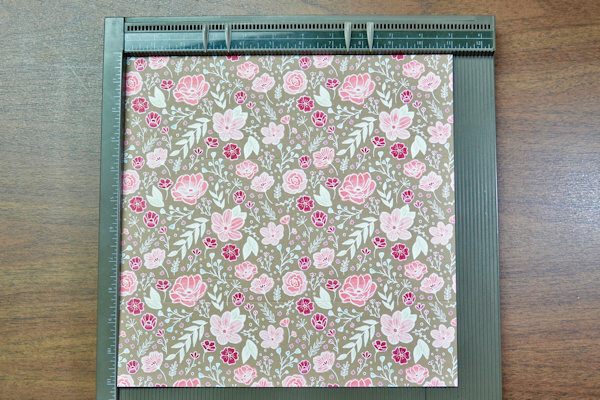 If the pattern is directional, place on the scoring tool in proper orientation (top of design at top of scoring tool). Score at 2 3/4” and 8 1/4”. Rotate paper 90 degrees and score at 2 3/4”, 3 1/2”, 7 1/2” and 8 1/4”. Burnish all score lines. Fold along the first two score lines so that edges of paper meet as shown. 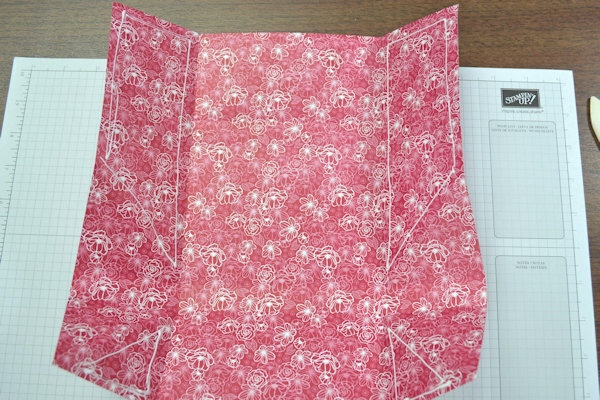 If the pattern is directional, rotate the paper so that the pattern is upside-down. The photo shows black markings along critical score lines for the next step – it is not necessary to mark your paper this way. Note that there are four 90-degree markings. Form four 3-D corners of pouch by folding at each 90-degree marking shown in the picture for Step 2. 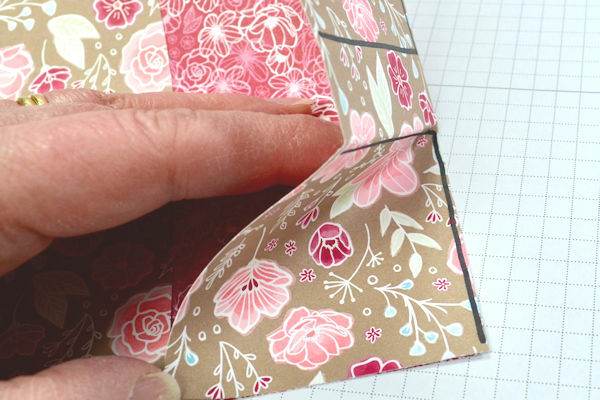 At each marking, fold to match one segment of the marking to the other, creating a diagonal fold between them. Open up paper and apply glue to limits shown. Refold along original two score lines. Round corners on flap end of clutch. Secure lining to front and back panels of clutch with adhesive. 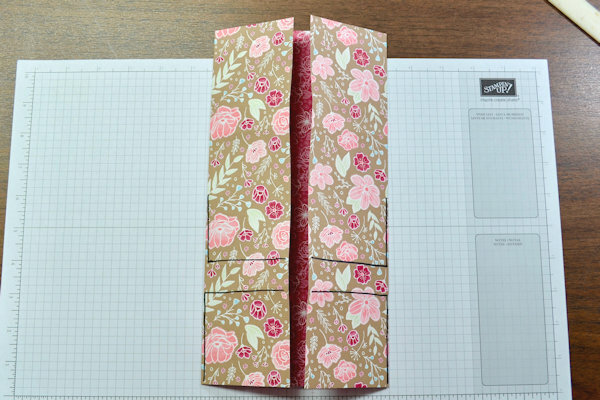 Add note cards (3 1/2" x 5" - A1 size) and envelopes, and tie clutch closed with ribbon. Add a tag if desired to complete the project. Using a 12"x12" sheet of paper, make your first scores at 3" and 9". Rotate, and score at 3", 3-5/8", 8-3/8" and 9". Follow the instructions above. You've seen the tutorial, now you try it! We've got a section of the gallery set aside for Note Card Clutch. Try this technique, then upload your artwork to the gallery. Show us your creations! Thanks Chris for a great tutorial. Project has been uploaded to the gallery. What a sweet little clutch. It's the perfect frosting on the cake for the gift of a set of notecards. Thanks for your tutorial Chris! 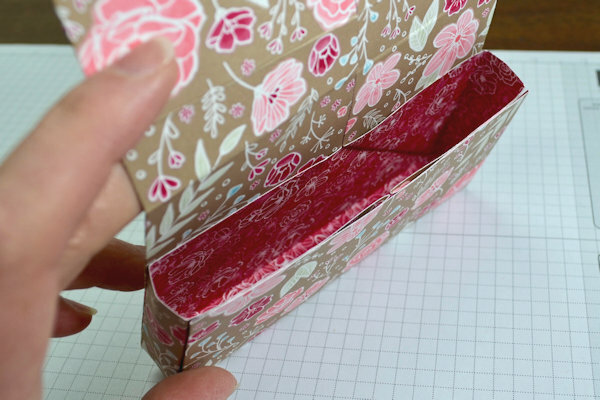 Thank you for your awesome video - this notecard pouch is exactly what I’ve been looking for ! Such a pretty design, tfs! Will this pouch also fit the envelopes? Patty, YES, the envelopes fit nicely. Such a nice project! Love this!! Just wondering how many cards & envelopes the clutch holds. Thanks for sharing. What a lovely project! I don't make notecards that small, as a rule - more the A2 size. 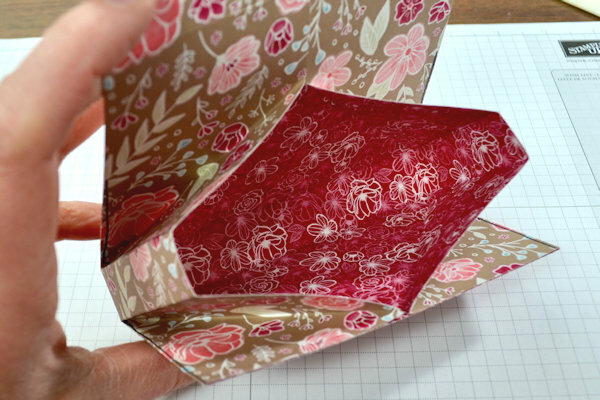 Can a clutch be made for that size from 12x12" paper? If so, where would the score lines go? Thanks! Valerie, I would say a set of 6 cards and 6 envelopes, if you keep them to just a few layers with no embellishments. Dianne, I added that detail to the instructions - thanks! 3-1/2" x 5" or A1 size. Diana, I'll add these measurements as a variation above, too, but YES - using a 12"x12" sheet of paper, make your first scores at 3" and 9". Rotate, and score at 3", 3-5/8", 8-3/8" and 9". Follow the instructions above. Thank you so much, Dina!! 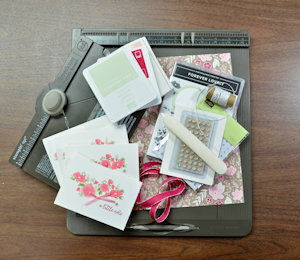 scrappersandi, I'd just use regular A2/invitation envelopes sized for cards that are 4-1/4"x5-1/2". What a fantastic idea! I always bundle up cards I've made throughout the year and give them as Christmas gifts. I'm always looking for a nice easy way to package them! Really cute project! 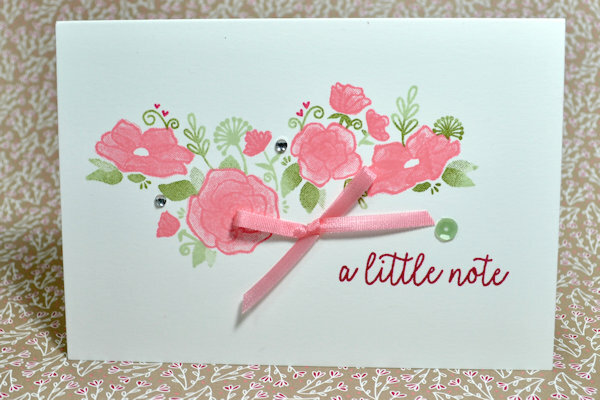 I love note cards and this makes gift giving simple too. I’m surprised at how simple this is to make- its very impressive looking!! 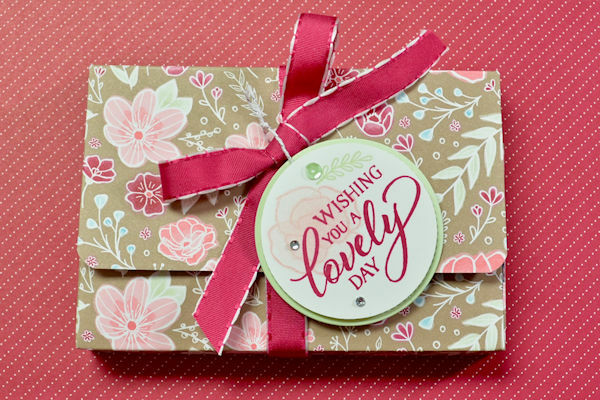 Chris is a long-time papercraft enthusiast and a Stampin’ Up! demonstrator of 8 years. She is married and has two daughters in college.